Slow Bullets opens with a soldier (Scur) being captured and tortured at the tail end of a war, after a cease fire is declared. When she wakes, she finds herself in a pod on a ship and doesn't know how or why she got there. By this point, things have already gone very wrong and they're about to get worse. The ship is populated by soldiers from both sides of the war, not much crew, and the various systems on the ship are gradually failing. Oh, and everyone has been asleep for much longer than they could have imagined. 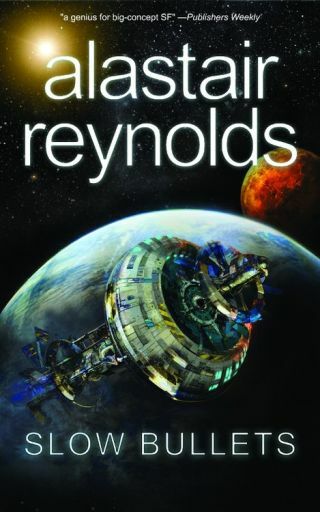 Once the initial conflict of Scur and her torturer (also on the ship) is mostly resolved, Reynolds gets us to the heart of the real conflict: what happens when civilization breaks down? We're talking about the ship, but we're also not because the ship is orbiting a planet that has seen better days. So has that corner of the galaxy, for that matter. Whether on the micro scale of the ship or the macro scale of the galaxy, Slow Bullets is a story of survival. There is a looming sense of dread that pervades the novella, with the very real chance that what is left will be a derelict husk of a ship orbiting a dead planet waiting for someone else to come by and benefit from the information left behind. This works and it works very well. After the groan inducing realization of "of course Scur's torturer is on the ship! 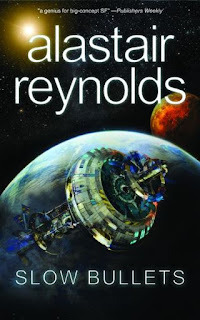 ", Reynolds settles down and ratchets up the tension bit by bit as the survivors choose which memories and personal and cultural knowledge they might need to give up to serve the greater good, to allow for the greatest chance of survival. It's fantastic. The novella's title comes from the idea of "slow bullets" that are capsules containing a wealth of knowledge and information and memory that can be inserted into an individual's leg and it will then ever so slowly travel painlessly through the body until it comes to rest in that person's chest, which is a fascinating concept.